Great news! TechnoKids Inc. updated our technology project TechnoFlash with instructions that will work with Flash CC. 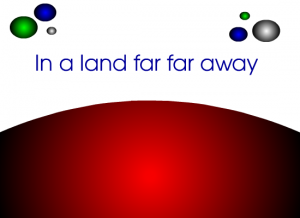 In this project, students are introduced to animation while creating a space adventure. They learn how to create frame-by-frame, motion tweens, shape tweens, and motion paths to produce a series of animated scenes. Once they have an understanding of the drawing tools, timeline, layers, keyframes, blank keyframes, and symbols they use their knowledge to produce their own Flash production. 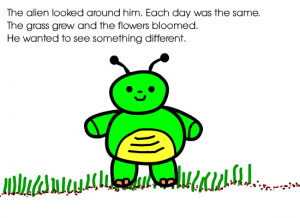 Ideas for applying learning include making a greeting card, animated scene, or simple story. NOTE: This animation project has been a favorite for many years. Students love it! 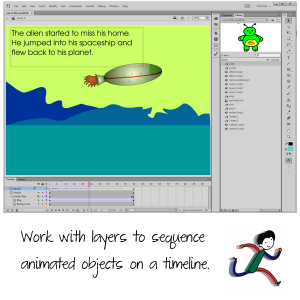 You can get updated instructions and activities for Animate CC in the project, TechnoAnimate. TechnoFlash CC includes a teacher guide, workbook, and resource files. Workbook files are digital, which is ideal for paperless classrooms. Sample flash videos are included to illustrate concepts. Other helpful teaching materials includes customizable reviews, skills reviews, and marking sheets. To start, students are introduced to Flash CC. They view a sample animation called “Out of this World“. Afterwards, they open Flash to learn about the program environment. Once familiar with the components, they practice drawing using the tools in the Tools Panel. They then learn how to manipulate images by scaling, skewing, and rotating. With these skills mastered, they apply their knowledge of the drawing tools to create the first scene in a space adventure. This activity introduces students to the library, timeline, and the purpose of blank keyframes. Students continue animating their space adventure using the detailed instructions in TechnoFlash CC. They create two scenes using frame by frame animation. This activity helps students gain an understanding of keyframes. To start, they create the planet surface that shows grass growing and a flower blooming. Afterwards, they apply their new skills to make a hovercraft drive over bumpy terrain. The session ends with students applying their knowledge to produce an animated sign or creature waving goodbye. 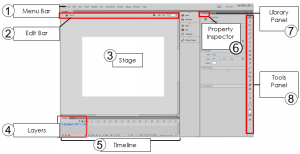 Introduce keyframes using frame-by-frame animation. 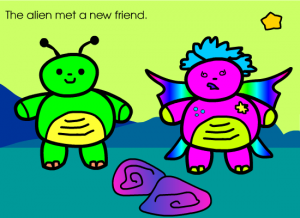 The fun continues when students create scenes that show their character blast into space and fly the ship across the galaxy using motion tweens. Illustrated steps explain how to move an object across the stage and transform the image by changing the scale and orientation. Once these skills are mastered, students animate the ship flying across the sky. The session ends with students opting to make a flying comet or spinning star using Motion Tweens. 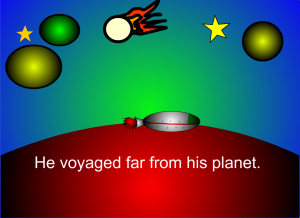 Next, students create scenes about a strange planet using the Flash CC assignments. Using shape tweens, they transform an oval into a rectangle to illustrate the unusual moon in the sky. Afterwards they apply shape tweening to show an alien life form talking. The session ends with students making an alien body part morph. Morph shapes using a shape tween. Students create the final scenes in their space adventure. In these scenes, the alien returns home. 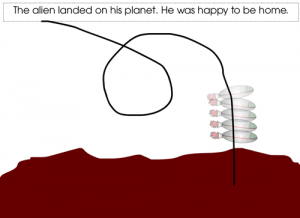 A motion path for the spaceship is made to look like it is blasting off from the surface, and then it does a loop in the sky before landing back on the home planet. The session ends with students either making a creature walk or roll realistically across the landscape. Once finished the Flash project, students apply their knowledge to make their own movie. To start, they select an idea from a list of suggestions. 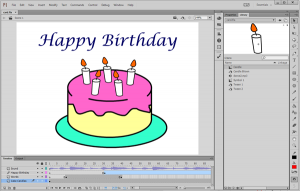 Sample animated clips are included with TechnoFlash CC as a source of inspiration. The movie can be an animated scene, short story, or electronic greeting card. Once students have made a decision, they use the Flash program to create the production, using the hints and tips provided as a guide. When the movie is complete, it is reviewed using a checklist, and problem areas are corrected. Once the movie is free from errors, it is published. TechnoFlash has been a project loved by teachers and students for many years. Learn more about TechnoFlash CC.